“Take the time to do what makes your soul happy”. “Happiness is letting to of what you think your life is supposed to look like and celebrating it for everything that it is. “Surround yourself by those who make you happy”. “Everything is a gift of the universe, even joy, anger jealousy, frustration or seperateness. Everything is perfect either for our growth or our enjoyment.” Ken Keyes Jr. I mean how profound is this? Young John Lennon’s mother taught him one of the most important lessons in life. Especially when as a young boy, his brain was at such a moldable state. That happiness is the most important thing to seek in life. That those who think otherwise simply don’t understand life. No matter how old we are, we can always use a reminder of this fact. We all want know how to be happy, well seeking it as your life goal not only will allow you to find more of it, you will give others permission to do the same. This is one of the ultimate dilemmas in life. Do we play it safe in order to be content, or do we risk it all in order to potentially get a lot more out of life, but without any guarantees? Well although it’s personal preference, choosing a life where you brave the storms of life will bring you a lot more experiences. Potentially both good and bad ones. But when it comes down to it, you can choose to grow from these “bad” experiences and obtain experiences in life you would have never known about. Also going with the secure choice isn’t really an option. I mean look at the subject of job security. Unfortunately it is a false illusion and millions of people have gotten burned from making the safe choice. Play it safe won’t allow to reach even close to your full potential! This is coming from one of the greatest self help minds of the ages. He also said this nearly 100 years ago. So ahead of his time. But what Mr. Carnegie is showing us is that it all starts in the mind. That your environment is an outward projection of what is on the inside. It also shows you that you don’t have to seek outside for happiness. The correct way is to look inward, like most all the great mystical teachers have always preached. It is also a reminder that the stronger we make our mind, the happier we will become. When you look back on your life, what moments brought you the most joy? For myself I know I am happiest when I am giving something of myself. I mean just think how much better a joke is when you share it with others. Or when you are laughing uncontrolabley unable to even share the joy you are trying to share! For some reason we are happiest when we are giving happiness instead of seeking it for ourselves. For some reason us human beings think about the past way too much. Looking back will never change anything and it is where most of our depressive thoughts come from. Even if we are looking back on an event where we were happy. Often times this causes us to miss that time in your life, causing more suffering. Humans are the happiest in the NOW. Looking back causes one depression and looking forward too far causes anxiety. It is best for us to stay in the present as much as possible! This is the harsh truth isn’t it? When it comes down to it, no one really gives a hoot if we are complaining and are miserable. Although we often act that way to get attention or simply feeling bad for ourselves. But at the end of the day, it won’t get you far. The beautiful thing is that we can change it with a simple decision, to not be miserable and to be happy. Even if our current scenario tells us to do otherwise. This is so crucial to having happiness right now. Often times we are so focused on “getting there”. Well be happy when we get that sports car or well be happy when we find the perfect person. But we often miss out on the incredibly beautiful blessings around us. Leaving us feeling incomplete and the people in our lives unappreciated. When we stop and look for the good things that are in our life, we can find so much. We become grateful and realize that people all around the world have it a lot worse. It is so awesome to see a child see something for the first time. They react so innocently and so intense. If we could do that as well to the things in our life, we would be able to re-experience those intense feelings again and again. Imagine what it would be like to do this to your loved ones and how good it would make them feel. In turn making you feel awesome as well. Become childlike! What we focus on expands. Yet we tend to only focus on the things that are going wrong in our lives. What if we counted our happiness, taking Fydor’s advice and calculate it. Set ourselves up for solving the equation of happiness by counting our blessings and calculating what we need to be happy. Simple quote that can change our perspective on happiness in a big way! This is an awesome quote because it shows us one of our biggest flaws. Holding onto stuff for too long. If we “forget” the bad things or the people that wronged us faster, it will lead to more happiness. Like a wise man once said: “Holding a grudge is like letting someone live inside your head rent free”. So that is it my friends! 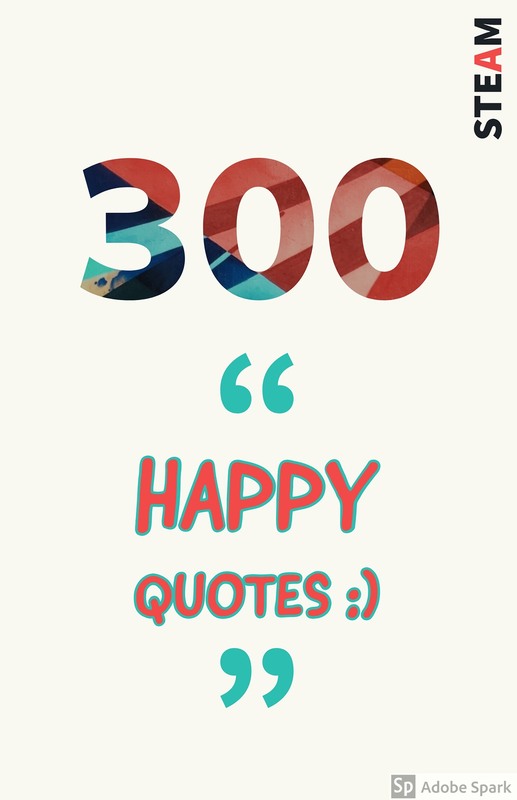 300 quotes about happiness and 10 lessons that we can take away from the list! I really hope you enjoyed this article! I would love to hear what your favorite(s) are as well as if you have any great happy quotes to add! Lets talk in the comment section below!